I was wary of returning to the scene of one of my favourite paintings of late, but I hoped that a different composition combined with everything I’ve learnt and experienced since, would be sufficient to make it a worthwhile exercise. 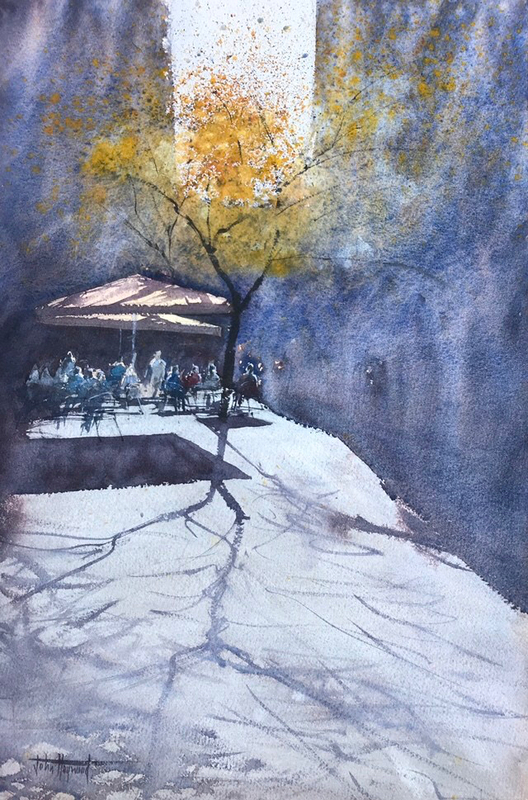 As a reminder, here’s my painting of a sunlit café in a Barcelona side street, and my blog post that described the process of painting this view. I purposefully didn’t examine this painting before I started work on my new one, however, elements of it were obviously in my mind and definitely influenced my approach. What made this view different however was that the focus was less on the light catching the tree but more about the play of light and the activity elsewhere in the scene. I was aiming for the same feeling of a bright and sunny day but with a little more definition and some added human interest. Most of this was painted wet into wet. Sadly a little too much to be honest! After washing in the sky, I started to paint the buildings too quickly with the result that I lost all definition of the edges as they bled into the sky, creating a very different ‘sense’ of light than I was aiming for! I felt that the view could be significantly improved by repositioning the figures so that they sat more ‘deeply’ into the painting. I thought this would improve the overall composition and enable me to treat them in a lighter and more suggestive manner. The second time around, I was sure to leave the sky wash until it had completely dried before starting work on the buildings. I’m really enjoying painting these half sheets using my enormous Da Vinci mop brush. It does mean that I’m using more paint than I’ve ever used before, but I personally think that the results are worth every penny. I seem to be spending more and more time focussing on my colour mixing, both in the palette and on the paper. I’m also painting much wetter than I used to. This again is paying dividends, but it’s also testing my understanding and control of tone. Painting with so much water means that the ‘dried’ tones are so much lighter than when I’m applying them very wet. All of these are minor concerns that pale (if you’ll forgive the pun) in comparison to the fun I’m having painting big and bold! I was much happier with this painting and pleased to have persevered with it. I think the figure work throughout this painting is a little lighter of touch and more nuanced than the first effort which, appears much more clumsy in comparison – although I do still prefer the dog in the first painting! Returning to this view was also a wonderful reminder of just how fabulous our 2017 trip to Barcelona was. Every time I paint another Barcelona scene it completely reawakens the whole experience for me – like having another mini-holiday! Speaking of holidays, regular readers may recall me recently bemoaning my lack of travel plans for 2018. One positive outcome of this was my determination to focus on discovering more scenes to paint from in around my hometown of Brighton. I’m delighted to also report another positive outcome. Seemingly unable to face the year without any exciting travel adventures on the horizon, I’ve booked flights to Porto in the autumn. I can’t describe how pleased I am to have this to look forward to. I’ve never visited before but have heard great things about Porto and am hopeful that, as well as being a wonderful holiday destination for a few days, it will also be another great source of inspiration for my painting! I’m impressed by your perseverance, John. I don’t know many painters who tackle scenes again and again, playing with various elements until they create something even more pleasing than the first (or second or third) attempt. Thanks for sharing your process, as well as the beautiful results. Thanks so much for this Jean. I’m not sure if it’s perseverance alone – maybe a touch of obsessiveness in there too! I think it’s because with every painting I feel I’m learning so much and it seems like the best way to try to put those learnings into practice is to try another version of the same scene. Thanks so much for your kind comments Jean – I really appreciate them! Not being a painter, I can only share my thoughts from the perspective of my photography background. I too much prefer your second version as it seems more balanced. The figures being a little farther “into” the painting, seem to draw one into the whole scene. I love your technique and the way you use the colors. I can feel the warm sunshine and the overall summer warmth. You really have a gift, John. Thanks for sharing. Hi Tim and thanks so much for your kind and generous comments – in so many ways I appreciate your feedback all the more because you’re not a painter but, because of your background in photography, you have an ‘eye’for what constitutes a good image. So pleased that you could ‘feel the warm sunshine’ – as I sit here now looking at the snow blustering around outside I could really do with a some of that warmth! Thanks so much again for your comments – really made my day to receive them! You are welcome. Thanks for the wonderful images and your insights. My way of thinking is painting wet into wet will push you to go deeper and bolder with your colors. 😉 You can bump it up in the needed areas while still wet. I think that you made the right decision to bring the figures deeper into the painting. Wonderful work, looser, more feeling. Is Porto a city in Portugal? Sounds exciting. Cheers! Thanks Margaret and I think you’re right about working wet in wet and being able to bump up the tones as I become a little more familiar and confident – I can totally understand why you also find it so thrilling! Overall though this one ‘felt good’ and I’m excited to see where things go from here! As for Porto – yes – it’s in Portugal – and that’s about the full extent of my knowledge – and partly why it’s also so exciting. I’ll put a guidebook onto the shopping list! !